Yesterday afternoon and last night were pretty dull and I was kind of moaning about it. I felt like doing something (though I didn't know what) but Hubby had a touch of a stomach thing all week and he wasn't feeling great. So we ended up sitting around watching a movie. Boring!!! But that all changed this morning. I headed out for my run, my plan was to do 3.1 miles because next Sunday is a 5k I'd like to do. So I'm hoofing along feeling pretty good, doing about 12 min/miles and thinking I will be able to do the 5k next week no problem. Then suddenly I notice this really white thing on the side of the road. Huh?? Then it moves! Huh?? 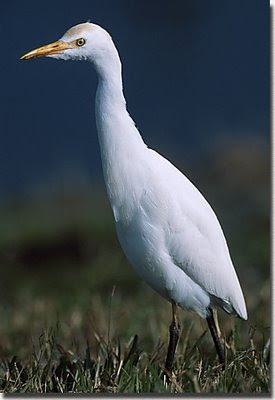 So I stop to look, it's a cattle egret with what appears to be 2 broken legs. Being the animal/bird lover that I am, I can't just leave it there to die. But I have nothing to carry it in, I was only running 3 miles I didn't take anything with me. So I decide to finish my run then come back and get the bird. It was here that I quickly discovered how hard it is to run at a reasonable pace when your adrenaline in pumping. I was worried about the bird and that it would get hit by a car before I got back. So I made it home, got a basket and a towel and went and got the bird. S/He is now resting comfortably while I wait to hear from the wild bird people on what to do with the poor thing. My run ended up being 3.1 miles in 42 minutes. Not too bad all things considered. awww, let us know how it turns out. Happy New Year! !